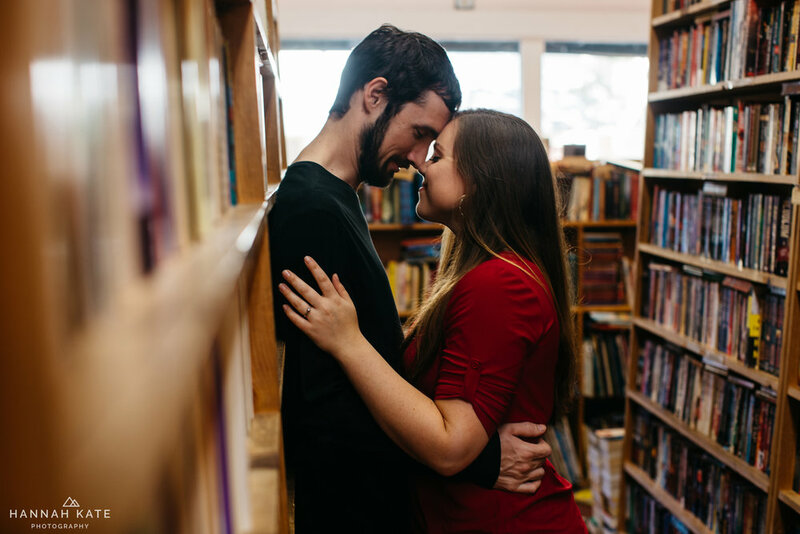 Seeing as I have a "Holiday Session Guide" plus a wedding day "what to expect" post, it's about time I've put together a helpful collection of tips and tricks for planning and preparing for engagement sessions, right?! If you're anything like me, having a clear idea of what to expect in terms of how to approach engagement sessions (starting at location choosing, wardrobe & hair all the way to posing and finally delivery) really helps calm the nerves and allows you to actually enjoy the process-- and honestly, it is a super fun process. Promise! So, let's dive right in! For all my wedding couples, the engagement session is complimentary to your wedding photography package and can take place really at any time before the wedding. A lot of couples like to use the portraits from the engagement session for Save the Dates, Wedding Websites as well as decor/a guest book for at the actual wedding itself. 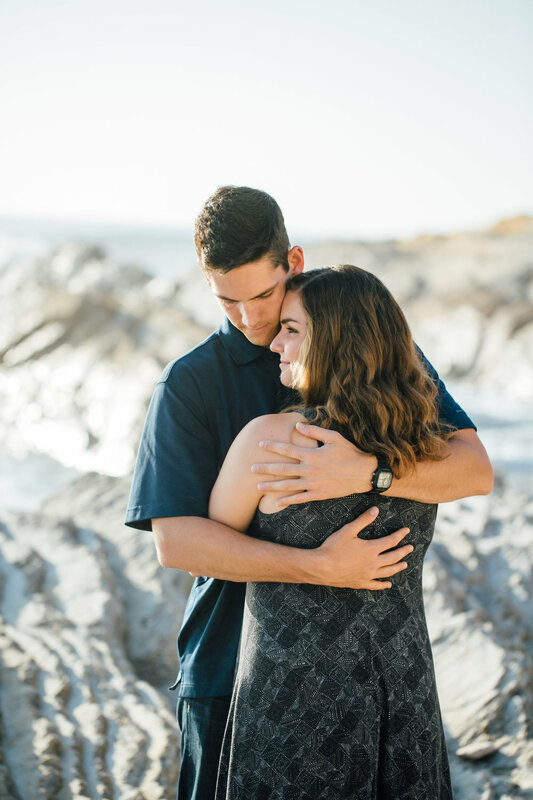 If you fall under that category and wish to use the portraits for more than just frames around the house, I would suggest booking your engagement session 6-9 months out from the wedding date. If you have a lot of guests from out of state that would have to make travel arrangements (airline tickets + hotels), I would lean more towards the 9 month mark so that you can get your Save the Dates out in plenty of time for your guests to start planning their travel. If a lot of your guests are local or there aren't many that will be traveling great distances to be at your wedding, sending your Save the Dates out around the 6 month mark is perfect. If you are having a longer engagement and have booked your wedding photography package more than a year in advance, you have a lot more leeway as to when you want to book your engagement session. If you do have more time, that means you can wait for the lighting/seasons to match up to your vision. For example, if you're getting married in August 2019 and you secured your wedding photography services in May 2018, you have a whole 9 months before you even hit the 6-months-out-from-the-wedding mark! 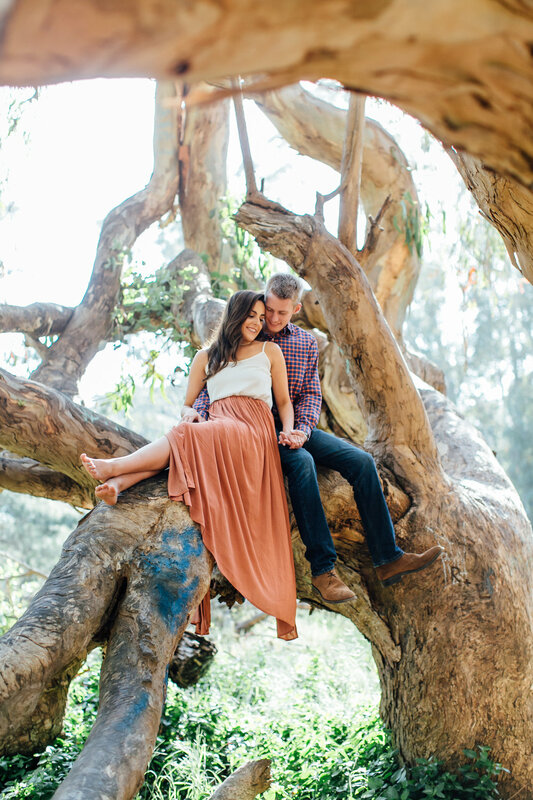 By securing photography earlier, your giving yourself a lot more time to plan and brainstorm the engagment session. 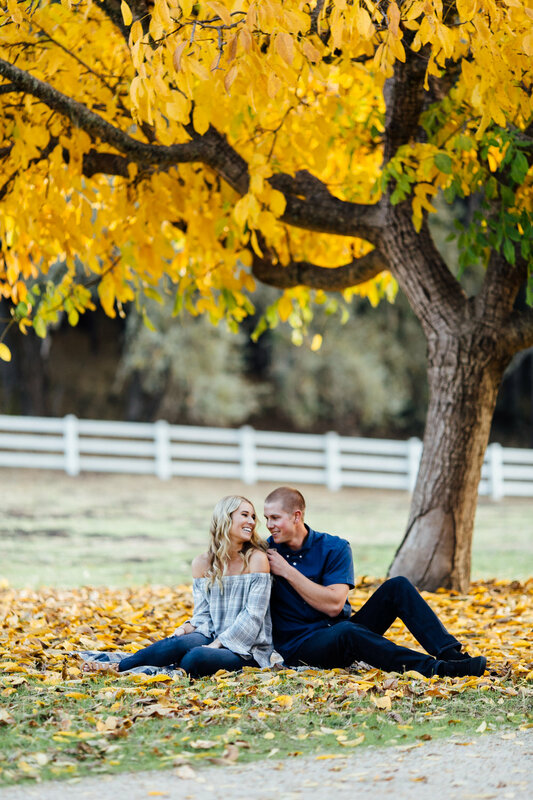 Because I have such heavy wedding seasons with 24+ weddings all over California from February to November and a steady stream of family sessions throughout the year, I highly suggest getting your engagement session date locked down as soon as possible-- especially for those fall engagement sessions! My weekend dates in October, November & December have all booked out by the first week of August for the last 3 years, so definitely pick a date and move fast! 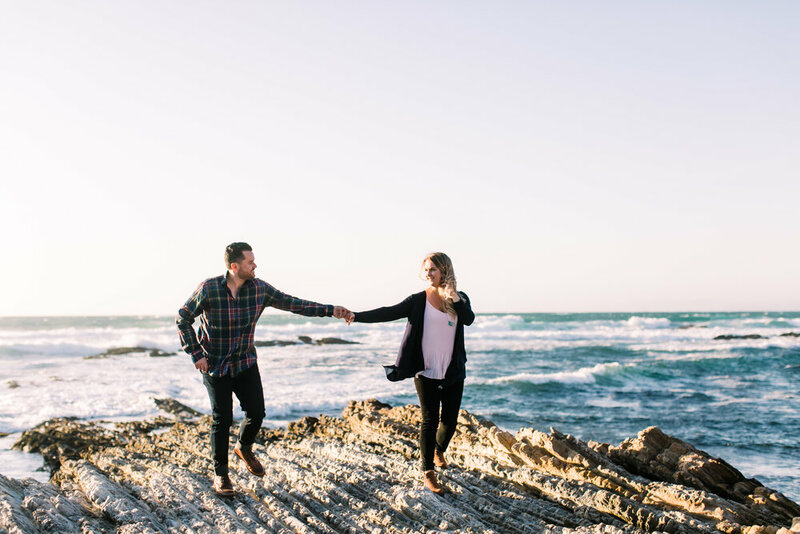 If you and your fiance are a little more flexible when it comes to what day of the week, week days usually don't book out as fast and generally give us less crowded locations. 1. Are there any spots that are particularly special to your relationship? Going somewhere familiar that is wrapped up in some of the best feelings and nostalgia adds another layer to the photos. I've had couples go back to the places they had one of their first dates or places that they even met. I've traveled to locations that hold some kind of significance to the either individual, whether it's relationship-based or just somewhere they truly love and holds a special place in their heart. 2. Would you like something a little different from your wedding portraits? 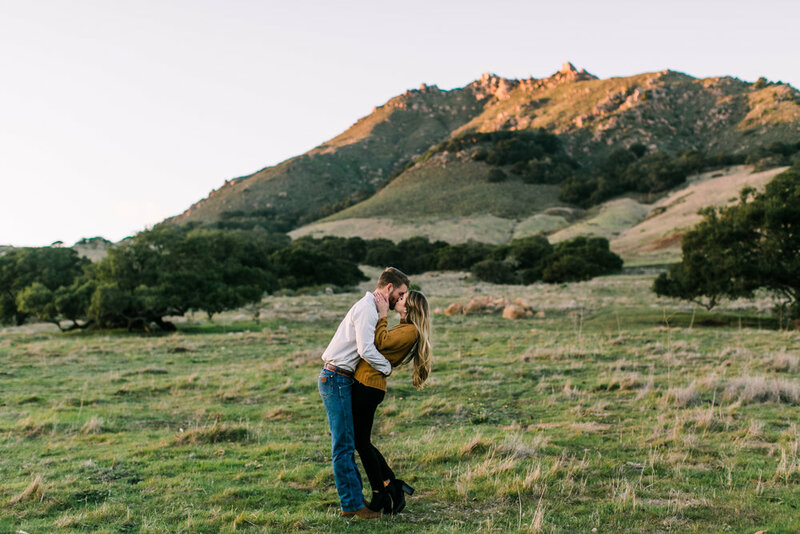 If your having a ranch wedding, you might consider taking advantage of the vast and unique landscape here on the central coast and going onto the sand and near the waves. If you're having an oceanside wedding, you might want to have portraits in the rolling hills or maybe look for a little more urban vibe. 3. Do you want to hit up multiple locations? Since engagement sessions are about 1.5 hours in length (give or take), a lot of couples decide to split the session between 2-3 locations. When picking multiple locations, it's key to consider the distance between each and how much time we'd spend traveling & setting up between spots. As the general rule of thumb, if we're in the car for longer than 15 minutes between locations, it's too far. 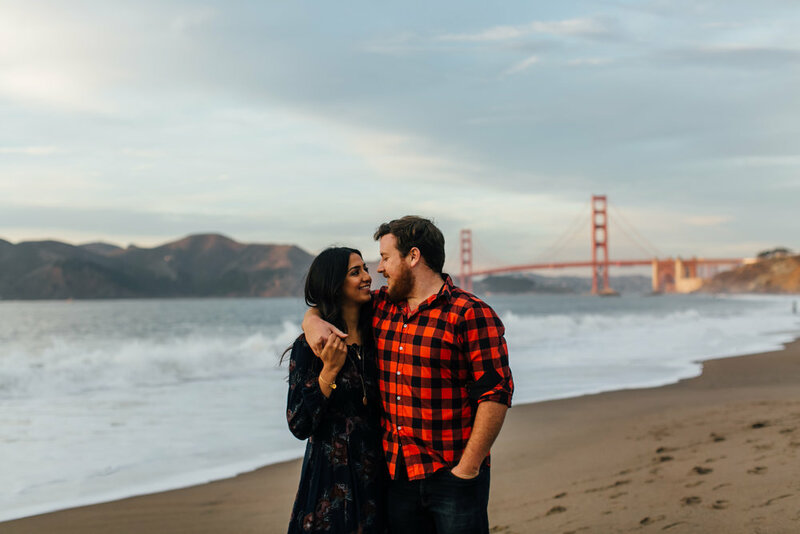 Because engagement sessions are 9 times out of 10 scheduled within the last 2 hours of sunlight when the light is so gold and soft and gorgeous, we don't want to be wasting the best light of the day driving 30 minutes here and 30 minutes there. If you're having a hard time coming up with a location(s), shoot me an email! I have a whole list of locations I shoot at regularly and can send examples of each space and what they have to offer. I am also always up for shooting in new locations, too, so don't hesitate to suggest a place! As far as actual wardrobe for the photographs, the biggest thing is that you want to make sure you pick outfits that you both feel comfortable in. If you don't feel 100% comfortable, no matter what we do or what we try, you're going to look uncomfortable in the photos. Same goes for anything restrictive or especially tight fitting. No one feels great moving around in super tight clothing, and that unease will definitely show. Think: Complimentary Colors. Instead of going matchy-matchy and being an amorphous blob of navy where it's hard to tell where one individual begins and another one ends, find a color story that has multiple shades that all compliment one another, but will give your photographs depth. Black, which I personally have a wardrobe that is 90% black, is not an ideal color when it comes to photographs. Black has the tendency to loose texture & depth as well as dominates the photo-- you don't want the first thing your eye goes to is a black button up, you want your eye to go to your faces! Neons or super bright colors-- like salmons & turquoise-- are also some shades to avoid. Neons especially create color casts, which essentially makes your skin a different color and in this case neon yellow. Color casts are difficult to correct in post production & processing, and can leave your photos with off-coloring. Also think about your location. A lot of people wear blues to ocean side sessions-- they probably think it's a place with a lot of blue, blue will look nice. But really all they're doing is blending into their setting. In more dynamic images, the subjects usually choose colors that create a contrast between themselves and the backdrop. Usually picking jewel tones achieves this without fighting skin tones. 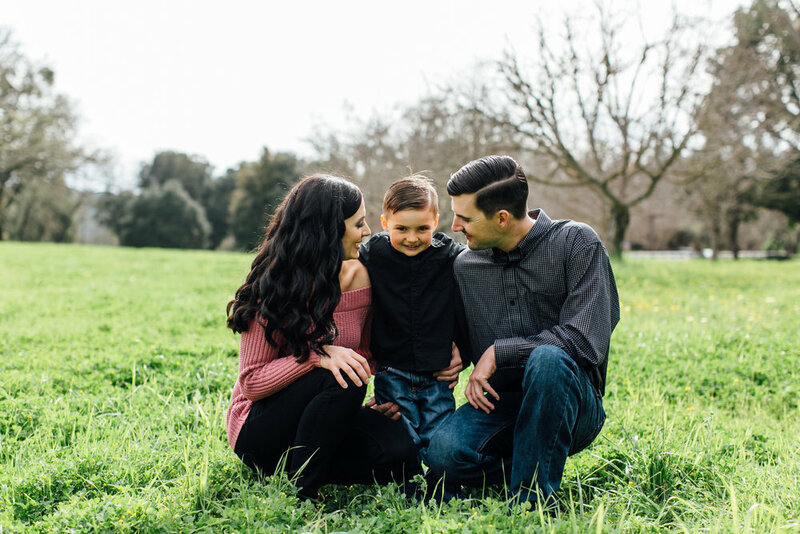 While having professional hair & makeup isn't an necessity for engagement sessions, or portrait sessions in general, it can definitely help boost the self esteem and make you feel photo-ready. Planning to have your hair & makeup trial for your wedding day look on the same day as your engagement session is sort of genius. You get to become familiar with your H&MU artist, you get to feel polished PLUS, it also allows you to see how your wedding day look will photograph and you can then make adjustments from there. Two birds, one stone my friend. Your hair & makeup artist will know long you should expect the trial to take, but I suggest aiming to have an hour cushion from the end of the trial to when you want to start heading out for the engagement session just to be on the safe side. It's not super common, but hair & makeup can run behind schedule for one reason or another-- and really, if you're going to have it take longer than expected, you want that to be on your trial day and not the wedding, amiright?-- so having that time cushion can be a real stress reliever. A) Getting sunburned and turning into a lobster before your session/in the photographs. B) Tanning unevenly and having super gnarly tanlines. While I would like to say I can lessen the contrast on a farmers tan, there's just some things that cannot be fixed. And normally the parts that get the super intense tanlines-- like arms & chests-- are not the easiest places to photoshop. or C) The spray tan turns you orange. If the urge to tan before the session cannot be suppressed, I highly suggest tanning the week PRIOR to the session, not the week of. If you're wanting to do a sunless tan to insure even color, opt for a natural glow and not the darkest shade available. Definitely look into spray tanning salons and familiarize yourself with their work, and again time the sunless tan so that you have a few days for the color to develop and adjust before the session. If you need referrals for excellent spray tanners that give natural & even results, email me! Coming up with some different activities that you both enjoy can really help take your minds off the photographs and allows you to authentically connect (like popping a bottle of champagne or bringing along an acoustic guitar). Whatever you decide, I think the most important part is to consider how realistic the props/activities are-- if thumbing through a record collection is not something you two find yourselves doing normally, doing it for the session isn't going to feel genuine. I know wooden signs with the wedding date or cute little sayings are all the rage right now and Pinterest seems to be flooded with them, and sure that can be super adorable for your Save the Dates, but I like to push my couples to think beyond just the stationary. While there's always going to be trends that ebb and flow, I think keeping the session as natural and authentic as possible is going to also make the photographs timeless-- which in turn makes it more likely that you will enjoy these photographs for a lifetime versus a couple years before such-and-such trend is deemed "overdone". Want to bring along your pup or maybe some kiddos so they can be in some frames? You absolutely can! The biggest obstacle for bringing along a pet or small kiddos for the engagement session is finding a person (be it a friend or family member) that can tag along as well and act as a babysitter for those times the puppy or child won't be in the frame. This person is honestly the make-it-or-break-it for a session running smoothly when there's more than just the couple in tow. If you'd like to bring along your kiddos, I have a whole blog post on helpful tips/tricks for family sessions here. When bringing along a pet, another thing to consider is any possible mobility limitations (for older animals) and any potential social restrictions (like if they aren't dog/people friendly, can't be off leash, etc etc). If your pet does have any limitations but you guys can't imagine the portraits without them, just keep their needs in mind when picking out a location. And if your pup can't be off the leash, I highly recommend bringing along a more neutral colored leash & collar. I know a lot of people have fun pops of color when it comes to their doggo's accessories-- purples, blues, neons, etc--, but just like your own wardrobe, you don't want the first thing your eye to go to in the photograph is the hot pink collar. Probably one of the most important preparations is for you two as a couple to sit down, look through some engagement photos-- whether that's mine or just searching IG or Pinterest-- and talking about what kind of images you are each drawn to. The next step is to then relay your expectations and vision to me. Granted, each photographer has their own unique style and flow when it comes to posing & the flow of a session, but there's also no way for me to know if you're looking for less romantic and intimate imagery and more so smiley and fun-natured portraits if that's not what I'm seeing happening organically during the session. Think about it-- I've probably only met with the two of you once before at this point, and while I like to consider myself a pretty receptive and observant person (traits I contribute to being pretty good a lifestyle + documentary photography), I don't really know your relationship dynamic from just spending an hour talking weddings over coffee. 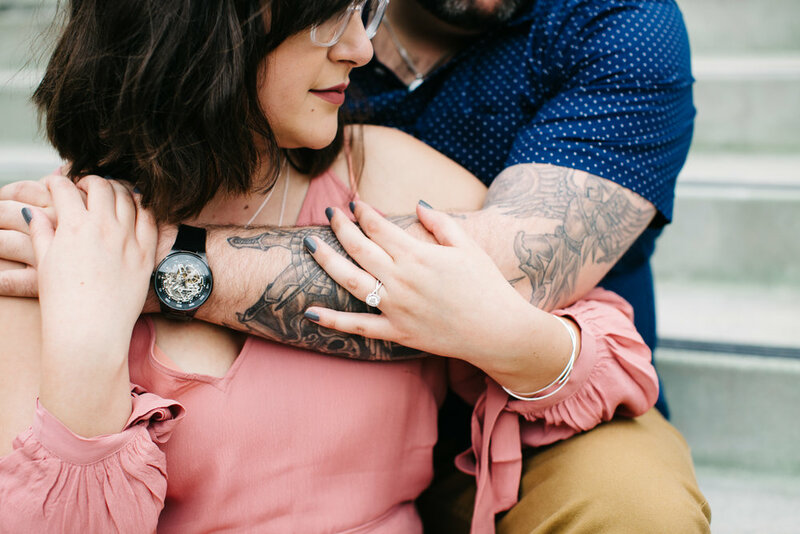 And this is also THE BIGGEST reason why I include engagement sessions with every package-- I want to be familiar with your relationship dynamic so that when I walk in on the wedding day, I know exactly how to do it justice. I feel like a lot of clients can fall into the trap of "following direction" instead of interpreting the suggestions and being themselves (which is understandable & not unexpected), so in order for me to better help guide you into getting the kind of portraits you have envisioned, communicating your posing style is absolutely key! Tennis Shoes-- If you're planning on wearing heels of wedges/any footwear that could be problematic to walk/hike in, pack a pair of sneakers so that you can change between spots. Lipstick/Make Up Touch Ups-- There's usually a fair amount of kissing & nuzzling, so bringing along some makeup to touch up either your lip stain or foundation to keep you feeling polished and photo-ready is super useful! Fun Flask-- Sometimes you just need a little liquid courage! It's kind of amazing what a difference taking a quick swig of alcohol before an engagement session can do for the nerves! Jackets-- Even if it's not a particularly chilly day, engagement sessions usually end right at dusk when the sun has hit the horizon. The majority of the time, there's usually a 10 minute walk back to the car and without the sun it can get a little brisk. 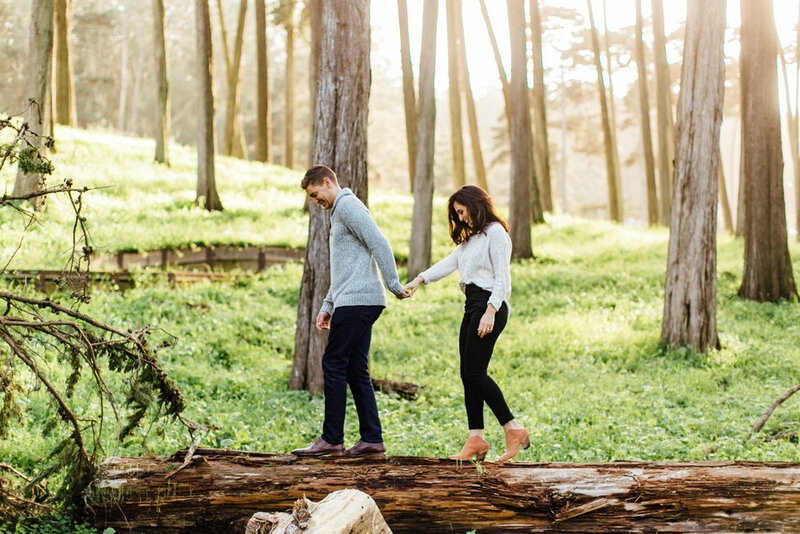 To keep the pressure low, try thinking of the engagement session as just one part of a fun date night! Heck, why not roll with that idea and make plans to follow the session with a yummy meal at a favorite restaurant or grabbing cocktails at a new hotspot? 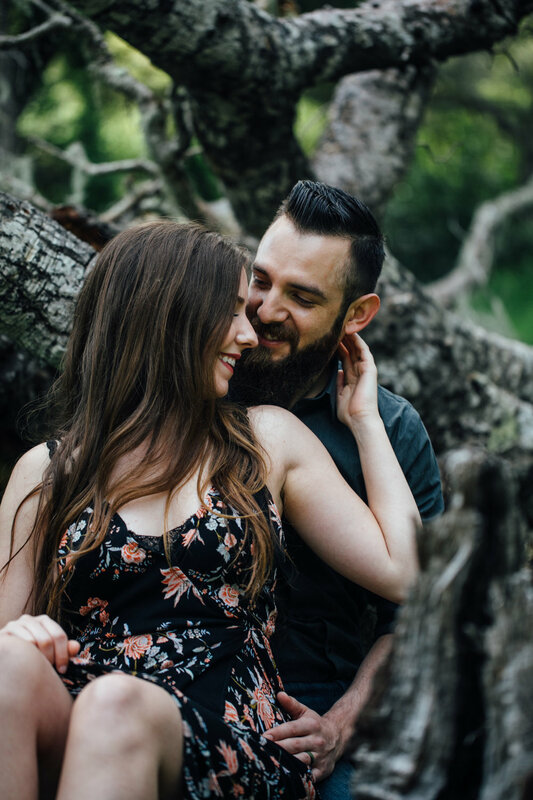 While engagement sessions are about getting beautiful portraits for you two to use for your wedding in one way or another, it's also a chance to spend some time together. My goal during the session to to really get you two to connect so that I can capture those micro expressions that flit across your faces & create emotive photographs that aren't just gorgeous, but more importantly have the ability to evoke feelings--- to give you that same warm & fuzzy and spilling-over-the-brim-can't-contain-it feeling that you had the moment the shutter was clicked. In order to really accomplish that, the subjects need to have authentic connection, and that can be kind of hard when your stressing about xyz & if your hair is placed just right or if this side of your face is actually more photogenic than the other side, etc etc etc etc. Keeping focused on each other and that "date" mindset will help allow the space for that connection to happen and for you two to fall in sync as if there wasn't a photographer standing only 10 feet away with a camera pointed at the two of you. "You're prepared! You ain't got nothing to worry about!" Don't you wish it worked that way? If you're still feeling a little nervous, which is completely understandable & 100% normal, it's all good! 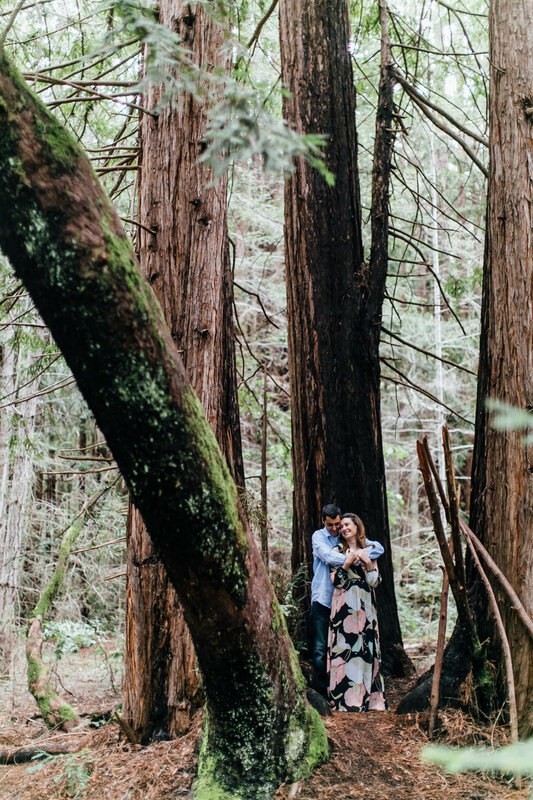 Generally speaking, couples only have an engagement session once, so it's okay to still feel a little overwhelmed and anxious going into it. Luckily you're working with a pro! One thing I ask of all my couples is to trust the process. While having ideas of how you want your portraits to look can be helpful-- both for you two and for me (see posing style above)-- it's also imperative that you trust in my direction and go with the flow. I've photographed nearing 100 weddings, which means I've photographed just about 100 engagements. Most of my work in general focuses on relationships, and in order to really showcase those dynamics in photographs, there has to be a certain level of connection and interaction actually happening. Sure, some of my suggestions may seem kind of silly, but it's really the reactions that I'm looking for! The more we move around and talk, the more engaged and focused on each other the two of you will be, & in turn you'll get some beautiful photographs that aren't stale and stiff. 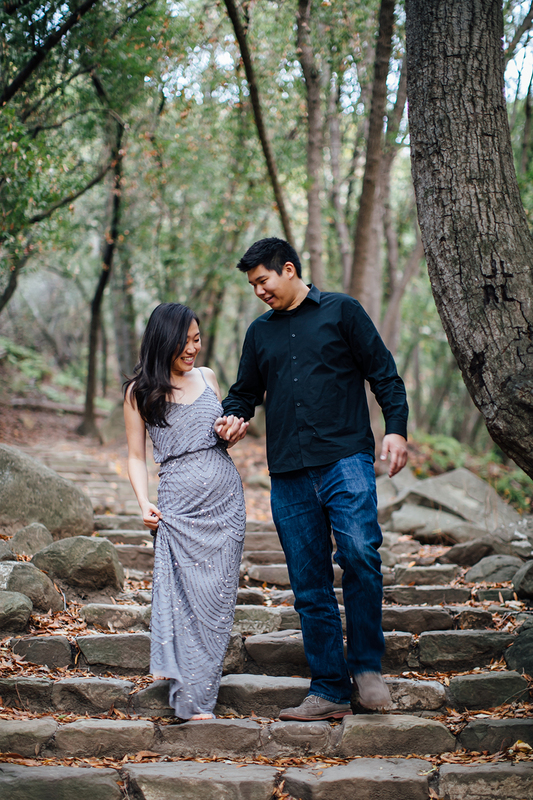 For sessions in SLO County, expect a sneak peek that night! For sessions that have required some travel (and put some distance between me and my desktop), the sneak peek should be along in the following 48 hours. The sneak peek will consist of 5-10 edited images in a dropbox link-- you can download the original resolution images right then! Within a week of the session, the completed final collection will be in an online gallery ready to download! For large gallery prints & guestbook albums, check out Artifact Uprising! They're my absolute favorite & the print lab I personally use for my home's large photographs and coffee table books. For smaller scale prints (4x6 up to 8x10), MPix has a good selection of products, accurate coloring & fast shipping. Still got some questions? No worries! Email me!